Living in Colorado means skiing, sledding, snowboarding, and snowshoeing. No wonder muscle soreness, aches, and inflammation can creep into our bodies. The Spa of the Rockies at Glenwood Hot Springs Resort has the antidote: Our Arnica Muscle Cure. Known as the mountain daisy, Arnica is a herb that has long been valued for its restorative abilities. At the Spa of the Rockies, we use arnica to soothe your muscle tissues. We begin by preparing your skin with a dry brushing technique that stimulates lymphatic flow for the optimal absorption of healing botanicals. A therapeutic full body massage is then enhanced by the regionally indigenous arnica and mint, while muscle soothing liniments are applied to your target areas. Finally, an arnica herbal body cocoon helps you to relax even further while making discomfort and stiffness in your muscles and joints a distant memory. Are you looking for the perfect romantic getaway? Upon arrival, you will receive a warm welcome from our friendly staff and have chocolate truffles and a bottle of champagne awaiting you in your room. This package also includes your choice of a $30 gift card to The Brew Pub or The Pullman for you to use toward a romantic dinner with your sweetheart. Rejuvenate the mind and body at our award winning Spa of the Rockies. Each registered adult will also receive a $100 spa credit to use on any spa services (excludes retail products) offered at our award-winning Spa of the Rockies. Includes unlimited access to hot springs and full hot breakfast. Spa appointments should be reserved three days in advance. Call for appointments at 877-947-3331 and inform reservations that you have reserved lodging package. Achieve a peaceful and relaxed state with this perfectly simple package offering our most popular massage choice. People have been rejuvenating here for over 125 years, and you can help us carry on this tradition. Each registered adult will receive their choice of one 60-minute massage*. Includes unlimited access to hot springs and full hot breakfast. If you are coming to Glenwood Hot Springs Resort for a true wellness experience, then this package is for you. It includes an upgrade to our full service Athletic Club, which offers racquetball, weight room, extensive cardio theater, indoor jacuzzi, steam room and sauna. Take a look at our fitness class schedule to see if you would like to drop in to a yoga, pilates or spinning class. Exclusive locker rooms, towel service and premium amenities are also part of this premier wellness experience. One Athletic Club upgrade is included per day per person, along with unlimited access to the hot springs and a full hot breakfast. Children 3 - 12 years of age may use the locker rooms and pool only, and children 13 - 17 years of age may use the rest of the facility only if they are accompanied by a parent or guardian. Fun, thrills and adventure are guaranteed as you spend a full day at the Glenwood Caverns Adventure Park. There is so much to do, you will have trouble fitting it into one day with this amazing package. All registered guests receive the All Day Fun Pass, which includes a tour of the historic "Fairy Caves" and full admission to all the amusement rides. Includes unlimited access to hot springs and full hot breakfast. Package is available May 20 - October 28, 2019. One park admission is included per person per stay. The Glenwood Caverns Adventure Park hours vary throughout the year based on seasons. Click here for hours and closure information. 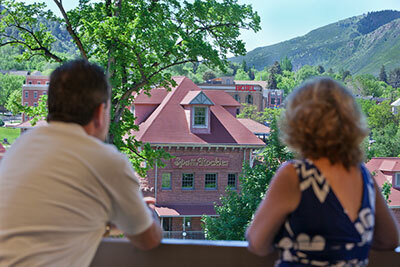 Experience everything Glenwood Hot Springs has to offer by staying longer and saving more. Stay any three nights or longer and receive 15% off your room rate, or stay five nights and save 20% off your room rate. There is so much to do here, you will need more time to soak it all in. Health, fitness, shopping, dining, rejuvenation at Spa of the Rockies are at the top of the list. Walking distance to downtown makes our location ideal for a longer getaway in Glenwood Springs! Includes unlimited access to hot springs and full hot breakfast. Become a member of our exclusive Glenwood Hot Springs Athletic Club for the day. You’ll enjoy an enhanced private locker-room experience with spa amenities and a soothing wet lounge featuring a steam room, dry sauna and Jacuzzi. The package also includes a full schedule of fitness classes like yoga, Pilates, spinning and water aerobics. There is a state of the art weight room and even racquetball/handball courts. Lockers and towels are included! Available all year long, except Thanksgiving and Christmas Day. Must be 18 years of age or older to purchase this package. Black Mud, derived from a mix of rich botanical minerals and thermal mineral water, is known for its powerful therapeutic properties. This full-body wrap works to soothe and rejuvenate tired muscles, as well as refresh dull skin. The mud wrap is followed by an invigorating Vichy or Sunflower shower and a magnesium-rich full-body massage. Taking inspiration from Native American culture and purification ceremonies, this experience represents different phases of ritual “sweats” and indigenous traditions to heal and purify the mind, body, and soul.